Welcome to mmm-yoso - a little foodblog hosted by Kirk, who sometimes lets his friends post here. Like today, for example, when ed (from Yuma) writes about some things he ate on his summer vacation. Although I have not lived in the Monterey area since 1997, I am fortunate to still have friends on the peninsula. And fortunately for me, many of those friends are almost as food obsessed as I am. With their help, I am able to eat in restaurants far from the beaten paths, places with no tourists in sight (well, except for me, I guess). This small restaurant is located in a little strip mall on Carmel Ave, a few blocks east of Del Monte Blvd in Marina, California. In fact, if one wanted to hide a restaurant in a location where almost nobody could possibly find it -- this'd be the place. The neighborhood is mostly residential and Carmel Ave is such a secondary street that there is no stoplight for it on Del Monte Blvd. Previously, this space and been occupied by Shinra Korean restaurant, which served me a couple excellent meals before it went downhill. I have no idea when the new owner took it over. Each of these giant ravioli was stuffed with lightly spiced ground beef and had been nicely grilled like a good potsticker. The spicy dipping sauce was a nice complement. Although the short ribs were cross cut, they were tender and pleasantly marinated. The five of us ate until we were stuffed like dumplings and agreed that the food overall was pretty darned good. The next time you're in the Monterey Peninsula area, stop at Shin La for a meal and say some friends recommended the place. Welcome to mmm-yoso!! !, Kirk's wonderful food blog, featuring the culinary adventures of Kirk and his friends. 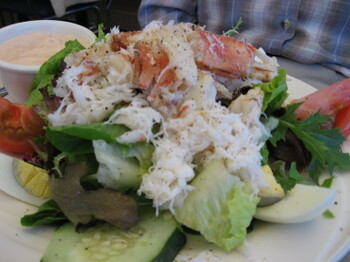 Today he is letting ed (from Yuma) post about a meal he had on Fisherman's Wharf in Monterey last summer. Perhaps some regular reader mmm-yoso!!! may recall that I claimed to have gone to two different tourist oriented, Fisherman's Wharf area restaurants on my last visit to Monterey. Although I was able to post about The Sandbar and Grill last summer, before I could describe my second touristy meal for my friends at this blog, my real job interfered, leaving you all (I am sure, of course) eagerly awaiting the posting about the other Fisherman's Wharf restaurant that I visited. Luckily, I have tasting notes and pictures because at my age the memory ain't what it used to be. After asking all of my gourmet/gourmand/foodie friends in the Monterey area about which wharf restaurant they would eat at, assuming that they were forced to eat at one, the consensus pick was Cafe Fina, owned by Dominic Mercurio, one of the men who had originally founded Dominico's, the Wharf's most famous restaurant (though according to my friends, no longer the best restaurant there). 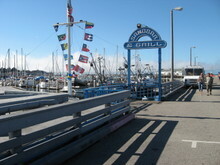 The two-story restaurant is rather narrow and small by Wharf standards and is located western/northern (left) side of the Wharf not far from the entrance to the dock. Except for the couple of hours before sunset (when we were there), some tables at the back of the restaurant would have a nice view of Monterey Bay and hundreds of boats. At first taste, I began to regret my decision to play tourist, as the soft bread was closer to supermarket French bread than to the wonderfully rustic, European-style breads that are regularly available in the Monterey area. 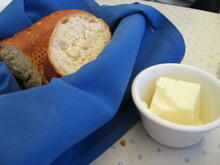 While the whipped herb butter was flavorful and matched well with the softness of the bread, I did not think that this was an auspicious beginning to the meal. 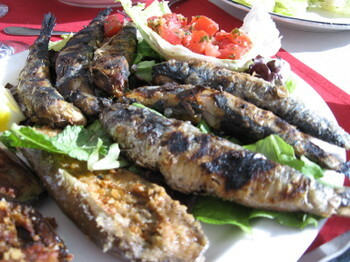 These fish were something new for me; every sardine I had ever eaten up to this time had come out of a can. I wasn't even sure how to eat them though I quickly learned that the bones were too substantial and crunchy to eat along with the flesh. I am just glad I didn't start at the head end. However, by simply placing a fork alongside the spine I was able to pull off a complete sardine fillet. These fishies were solid, mildly but distinctively fish flavored, slightly smoky, and very basic in taste. I can imagine old fishermen eating these on some Mediterranean beach a hundred years ago. A truly primal flavor. Again, this item tasted traditional and basic. 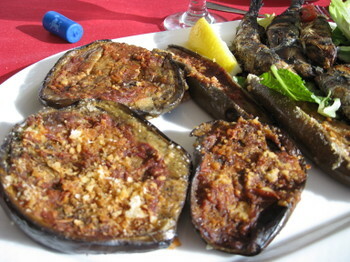 Although I found the mild flavor of the eggplant (mostly tasting of olive oil) a bit lacking for seasoning, Helen happily scarfed up most of this half of the appetizer. In contrast with the second-rate salad from the Sandbar and Grill, this version is what I expect in a Caesar salad in a restaurant. The flavors of garlic, Parmesan cheese, and anchovy came through the creamy dressing. A whole anchovy fillet that lay across the top of the salad quickly found its way into my mouth. Yum. As you can see, this picture is uniquely awful. While I was trying to show how large some of the discs of clam meat were, all I succeeded in showing was that someone should never take a close-up photo of a soup-spoon sized pale colored clam slice, covered in cream colored broth, posed over a white bowl of light-colored soup. The fact that, in addition, my shaky hands blurred the photo probably neither added to nor detracted from the results. This fillet was wonderfully tender, moist, and not overcooked, and the flesh broke apart at the touch of a fork. 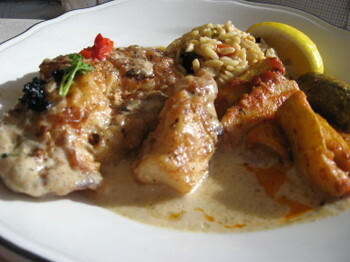 The marsala sauce, while more assertive than the brandy sauce, still did not overwhelm the fish. Both of our entrees were accented with dollops of dark caviar and bits of chopped roasted red pepper and were accompanied by a savory mound of homemade orzo pasta (toothsome if not aggresively al dente) and by zucchini strips sauteed in olive oil with a touch of marinara. Both Steve and I were very pleased with the mains and the side dishes. This traditional Californian combination of small shrimp and chopped fresh Roma tomatoes, California olives, and green onion, served on top of fresh homemade linguine, was the best version of this dish I have ever tasted. In particular, the flavors of the various ingredients were brought together by the light seafoody sauce full of garlicky shallot flavor. This picture does not properly show how gigantic this serving was. Helen was also amazed by the quantity of toppings on the noodles. This was not a huge pile of pasta lightly covered with toppings, but instead, the portion of shrimp, in particular, was huge. She took home most of her entree and happily reheated it as an early dinner the next night. Overall, we agreed that this was a good meal. Unfortunately, I have lost the receipt, so I don't have a specific idea of what each item cost (though the web site gives entree prices at around $20), but we felt that we had received good value, considering that Cafe Fina is a Fisherman's Wharf restaurant. In addition, we were told (a number of times by our friendly waitperson) that the restaurant grows most of its own vegetables organically on its own farm. Similarly, all the pasta served in the restaurant is homemade. While Cafe Fina is certainly a tourist oriented restaurant that sticks to the basic Mediterranean/Italian flavors common to most old-school Monterey restaurants, the three of us agree that the dishes that we had had were generally tasty and interesting. Heck, I would happily go back there and play tourist again. Cafe Fina, 47 Fisherman's Wharf #1, Monterey CA, 1-800-THE-FINA (843-3462). This is Kirk's wonderful food blog, mmm-yoso!!! Every once in a while, he lets Cathy or me (ed from Yuma) do a post. 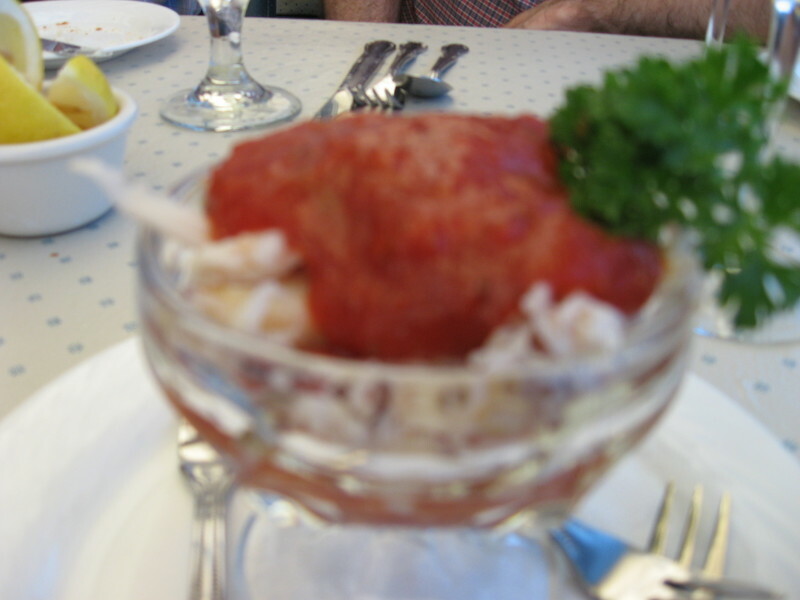 Today, I want to write about eating like a tourist in Monterey. One of us first meals that I can remember eating after I moved to Monterey many years ago was at a restaurant on Fishermen's Wharf. Believe it or not, I never ate another dinner at the Wharf, one of Monterey's major tourist attractions, for the rest of the time that I lived in the city. Why? Because no self-respecting local eats at Fishermen's Wharf. All the locals know that the food in the Fishermen's Wharf area is not especially innovative and will usually cost 25 to 50% more than the same meal purchased elsewhere. However, as a regular on Chowhound, I have learned that not every person is as intrepid as Kirk, who we all know would happily ride public transportation in a strange city for an hour and a half just to sample an especially authentic version of papaya salad with salted blue crab. Many visitors to Monterey aren't looking for the very best restaurant, if eating at that restaurant involves following complicated directions and driving through strange towns. Also, many visitors to the Monterey Peninsula are spending $250 a night for a motel room, just so that they can look at the beautiful bay instead of the cornfields or industrial landscape they live in and work in regularly. Therefore, they want to eat at one of the tourist restaurants with a nice view. In fact, this restaurant is slung down below the level of the wharf, providing diners with a unique sea level perspective on the yacht harbor, full of various boats bobbing and rocking from wind and waves. A few years ago, my friend Chris and I had stopped here for an afternoon cocktail, and we were very impressed with the view. Unfortunately, on this visit, the sun was shining brightly through the windows, so the restaurant lowered its blinds and whatever view we might have had through the slats was obscured by the glare (which is why there is no beautiful picture from inside the restaurant of the yacht harbor boats at anchor). While far from the best bread I was served on this visit, the sliced sourdough from Palermo bakery would provide a visitor with a nice introduction to Monterey sourdough, the slightly tangy crumb being surrounded by a decent, if not overly crunchy, crust. 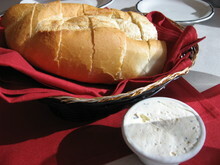 For locals, the bread was nothing special, but if I were visiting from Iowa, I would have been very impressed. Although Steve was quick to note that the wine list had no vintage dates on it, I thought it was generally a good and inclusive list for a tourist restaurant. 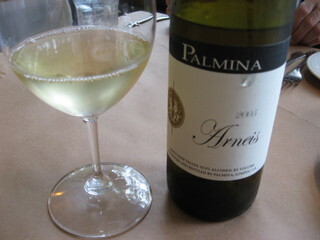 For example, a bottle of Vermentino was listed for only $24. While the wine list is not nearly as extensive nor as well priced as the one at Passionfish, prices were fair enough, and there were enough choices that I had trouble making up my mind. There were several large leg and claw chunks like this one in the cocktail. 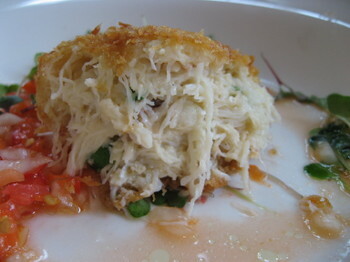 The crab meat was sweet and succulent. My only complaint, and it is a minor one, is that the cocktail sauce was pretty ordinary; I'm sure I could make a better one at home. If I were to order this dish again, I would request the sauce on the side. The salad was, in my mind, pretty sorry. While it was sprinkled with grated cheese, there was very little creamy dressing for the fresh romaine leaves. The chowder, on the other hand, was tasty -- a much better chowder than the standard pasty glue pots full of salty clam base that are often called clam chowder and served in tourist restaurants. Clams, celery, and potatoes added textual variation to the flavorful and creamy broth. The use of bay leaves added an herbal dimension to the flavor. I was also extremely impressed by the coarse, spicy, and flavorful fresh black pepper our waitperson ground onto the surface of the soup. It seems strange to me to comment about the quality of the black pepper, but to be honest, this pepper was extraordinarily tasty and made a major contribution to the chowder. Both salads were accompanied by wedges of hard-boiled eggs and rather ordinary supermarket tomatoes. I was impressed, however, with the mixture of greens used. 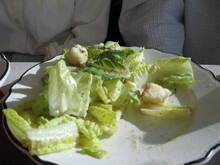 The base for both salads was chopped romaine, which provides body and crunch. 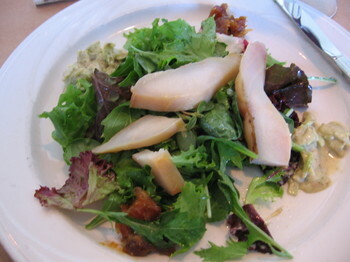 But both salads also contained delicate Salinas Valley greens, which provide taste and color variations. Helen's Louie dressing was a creamy version of this classic, with decided spice and tomato flavors. 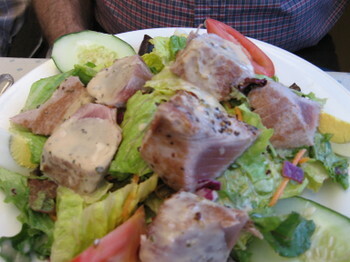 While Steve pronounced himself happy with the lightly dressed ahi salad and quickly gobbled it up, I thought the ahi itself was not as fresh and pristine as I would've liked. Not bad, mind you, but certainly not sushi quality fish. Sand dabs are a tiny species of sole (or perhaps flounder) unique to the central and northern California coast. The version that the Sandbar and Grill was good if not outstanding. The seven or eight little filets were very fresh and had a light and sweet flavor. The light breading on them was okay, but not crunchy. Rather than being sauced, the dabs were served with a lemon wedge and an excellent homemade tartar sauce, its creamy mayonnaise smoothness studded with tangy capers and bits of chopped onion. The side dish, linguine with vegetables and a little touch of olive oil, was nothing special although it matched well with the fish. I really wasn't sure what I would find when I decided to go eat with the tourists. I have to admit that my experience at the Sandbar and Grill was better than I expected. Even without the view, and even with a couple of items that were not as good as they should have been, my overall experience was positive. This is certainly not the finest dining on the Monterey Peninsula, but the food was good and the service was attentive if a bit obtrusive. I guess it is somehow fitting for me to try a couple of tourist restaurants since, hard as it is for me to admit, ed from Yuma is now a tourist, not a local anymore, in Monterey. While Kirk and Cathy are no doubt eating well and will soon share their experiences with you, this is ed from Yuma again. 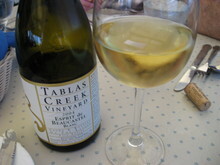 This time I am writing about a scrumptious meal I had while on vacation in Monterey. We all know (or have heard of) someone who is a fanatic about his/her barbecue. It has to be beef (or pork), it has to be ribs (or brisket), you have to use oak (or hickory or applewood), it has to be smoked for 8 hours (or 12), the dry rub has to be composed of the following spices (what ever) , the sauce must be based on tomato or molasses or mustard, and it has to be sour or sweet or spicy hot or etc. etc. Well, I like barbecue in general, but don't care that much about how it is prepared, as long as it tastes good. On the other hand, I am a fanatic about prime rib because there really is only one right way to prepare it. And today, almost all restaurant "prime rib" is crap. 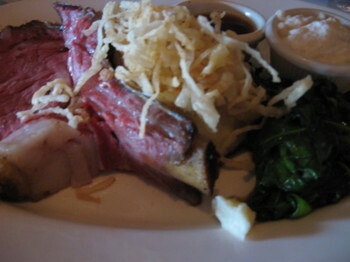 Because I am such a fanatic about prime rib, I have largely given up ordering it when I go out to eat. My life has been full of enough disappointments without more lousy prime rib. So why were Steve and I walking into the Whaling Station, John Pisto's flagship restaurant in the Cannery Row area of New Monterey, looking for prime rib? There are two simple answers. First, Helen had had an early dinner because she had to work the next morning, so Steve and I were free to go out, be manly, and gorge ourselves on meat. More importantly, the previous year as I was walking around reading menus (doesn't everyone walk around and read menus? ), a sign next to the Whaling Station's menu proclaimed that each night the restaurant had one slowly roasted prime rib roast, and when that roast was consumed there was no more prime rib that evening. As I read that, my heart skipped a beat (I'm sure it had nothing to do with the projected cholesterol). It sounded like the prime rib at the Whaling Station was worth a try. After we sat down, we made sure the prime rib was available, and then I asked the question, "how is the prime rib done this evening?" The waiter responded that the roast had already been cooked 12 hours and that it would be rare to medium rare at this time. Exactly what I wanted to hear. We placed our orders, and it was all I could do to keep from drooling onto the table in anticipation. While not as good as the bread at Passionfish, this was excellent Monterey Peninsula bread. We actually ate very little of the bread because our first courses showed up soon afterwards. 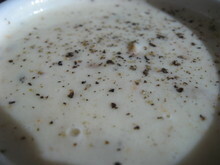 Like prime rib, I have been eating clam chowder virtually all of my life, and I know how it should taste. As soon as I took this picture, I quickly dipped a spoon in and savored the soup. The broth was rich with clam flavor and smooth and creamy to the tongue. No gloppy, floury paste here. Most clam chowders get their texture from potatoes and/or celery. 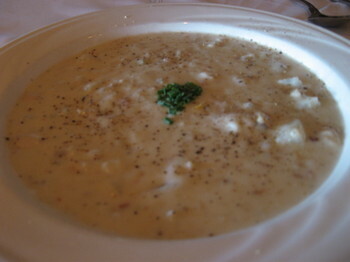 In this chowder, while potatoes were present, the main textural elements were the numerous pieces of chewy clam. This was certainly one of the clammiest chowders I can remember eating - or, rather, tasting, as Steve inhaled the bowl so fast that I couldn't slide another spoon into it. In general, I eat iceberg lettuce rarely as it has very little flavor and provides only crunch in a salad. 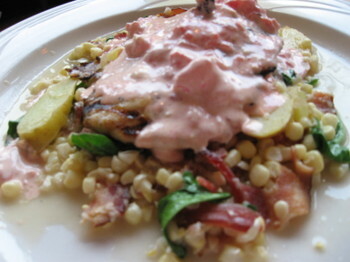 However, its nearly flavorless crunch is a perfect foil for an excellent blue cheese dressing, which this was. The wedge of crispy fresh lettuce was totally covered in dressing, which also pooled around the lettuce on the bottom of the plate. Served with a steak knife, the salad seemed to expand as I cut into it, pieces of lettuce and chunks of cheese tumbling down onto the plate. It was rich and heavenly. Like prime rib and clam chowder, blue cheese dressing is another childhood favorite. My mother cooked in and managed a basic blue collar American food restaurant when I was growing up, but she used to brag that her blue cheese dressing was better than that served at the country club in town. This dressing would've made my mother proud. It had a a creamy richness, great flavor, and numerous chunks of blue cheese. There was more to the salad than just the lettuce and dressing as you can see in the picture. Radish slices, cucumber slices, thin ribbons of carrot, and chopped green onion provided nice color contrasts. The accompanying garlic bread was equally outstanding - crunchy, buttery, and full of garlic flavor. As high as my expectations were, this piece of rare prime rib exceeded them. 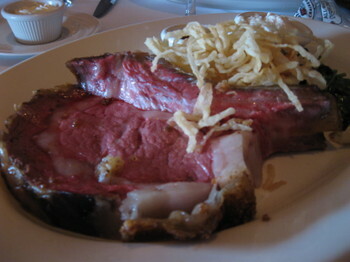 Since Steve and I had ordered the smaller prime ribs ($29.95), I was pleasantly surprised to see an attached rib bone. The beef was fork tender, richly flavored, and wonderfully juicy. As I write this, I am starting to drool again as the memory of the meal comes back to me. The spinach was just barely wilted and full of green spinach flavors. The few bits of bacon in the spinach were overwhelmed by the leafy goodness of the vegetable, but the chef's careful touch showed off in the freshness and intensity of the spinach taste. In my picture, it is hard to see the rich and creamy mashed potatoes, bursting with buttery goodness, because they are hidden under thin shards of deep-fried potato. Those shards added a nice textural contrast with their thin strips of crunch to the creamy goodness underneath. In the background, there is a ramekin of beefy and slightly salty au jus, just in case the prime rib was not rich enough in flavor, and another ramekin with two preparations of horseradish, if one wanted a spicy touch to the meal. While I tried both horseradishes and the au jus, the prime rib was good enough by itself. The triangle of super chocolatey cake was decadent indeed, and the presentation was very pretty, but I found it the least impressive part of the entire meal. I am not saying that this was a bad dessert, but it is a desert that I have had equally well prepared in several other places. Of course, it is just slightly possible that I was so stuffed and satiated and delighted and satisfied and happy with the savory courses that no dessert could have made me feel any better. Although this post has been focused on prime rib, I should point out that The Whaling Station also serves a large variety of prime steaks and seafood dishes. The tuxedoed service was attentive and inobtrusive. While definitely not an inexpensive dining option (though not as expensive as the neighboring Sardine Factory), I suspect that anyone looking for an upscale meal in the Cannery Row area would do well at The Whaling Station. After looking at an early draft of this post, Kirk called me "a prime rib Nazi." Maybe he's right. Nonetheless, most of the time that I mention prime rib to my friends who care about food, they often ask why I waste my time on such a meal. What has happened to these people (I think) is that they have gone their entire lives without ever once having had real prime rib. After eating lousy "prime rib" a few times, most people with functioning taste buds stop ordering it - and for good reason. But I think that if you experience the sinful goodness of outstanding real prime rib, you might well become a prime rib Nazi too. 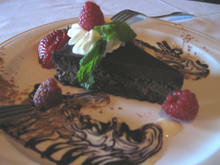 Whaling Station, 763 Wave St, Monterey CA 93940, (831) 373-2460. I am sure that Kirk and Cathy are eating well and will soon share the details with the rest of us. Today, though, this is ed from Yuma focusing on the entrees at Passionfish on the Monterey Peninsula. Next time I post, I promise it will be about someplace different. As most of you are able to tell by now, I am a fan of Passionfish in Pacific Grove. Not all of my meals of Passionfish have been outstanding; in particular, I can remember one clunker of a meal about five years ago. On some visits, a dish may not satisfy me as much as most dishes at Passionfish have. Nonetheless, three things remain constant at Passionfish. First, the dishes will be creative and often innovative. Second, the wine choices will be numerous and the wine will be priced close to retail. Third, the meal will represent an excellent dining value, particularly in comparison with the other restaurant choices in Carmel and on the Monterey Peninsula. A major reason that this restaurant continues to lure me back again and again is that this is a restaurant with a vision. The couple that owns the restaurant, Ted and Cindy Walter, each has an important role in Passionfish's success. He is the head chef, and she manages the dining rooms. The restaurant represents their personal passion and their individual dedication to the art and science of running a restaurant. Unlike so many restaurants that begin well and then go into a long declining phase, Passionfish has continually improved over the years. The dining rooms have been redecorated to make them more appealing. The chef is constantly working on new flavor combinations and keeping what he is most satisfied with and tweaking dishes that need improvement. In my third and final post about Passionfish, I want to share with you the most interesting and best tasting entrées I've eaten (or at least gotten a taste of) over the last couple of years. It seems that ever since the restaurant opened, there has been a version of this dish on the menu. Last year, a moist, rich, and tender hind quarter of a duck was paired with succulent braised fennel and spicy chili potatoes. It is hard to believe that this duck has first been cooked in fat and then grilled because it is not at all greasy or oily. The meat literally falls from the bones. 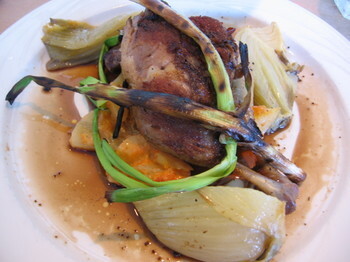 Braised fennel may be my all time favorite vegetable - tender, lightly flavored, and rich. The chili gratin potatoes add a nice contrast in terms of tastes and textures, while the Carmel Valley honey reduction provides a note of sweetness that helps bring all the flavors together. The tender, perfectly cooked sablefish was moist and tasty, it's mild flavor shown off by the intense black pepper crust. The accompanying items offered a wonderful contrast to each other. 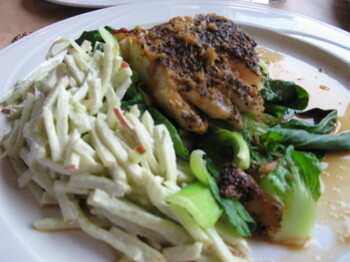 The julienned red apple slices in the wasabi slaw added spicy and fruity notes to the dish. On the other hand, warm sautéed baby bok choy contributed notes of fresh vegetable greenery. 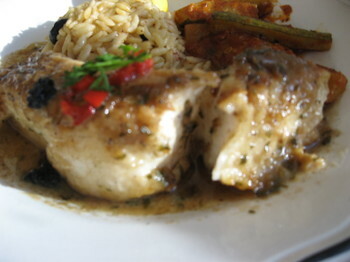 For added flavor, the fish was accompanied by a ginger vinaigrette, adding a touch of contrast with its sour spicy tang. 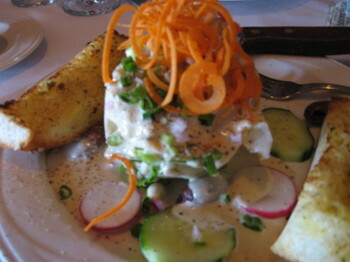 Last year (as pictured) we had the dish as an entrée ($20); this year it was an appetizer ($10). The main difference is in the number of shrimp (eight or four) and the number of cabbage rice fritters (two or one). 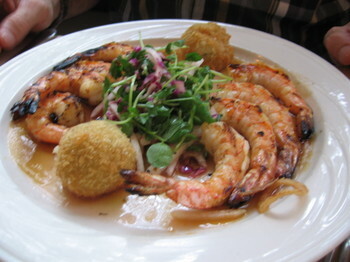 The shrimp are always perfectly cooked: moist and juicy inside and slightly charred on the outside. 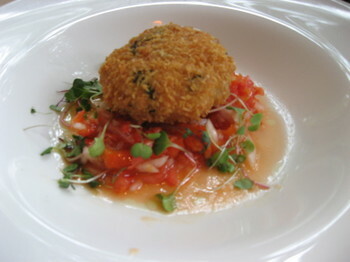 The fritters similarly showed the chef's sure hand, the crunchy exterior completely covering the soft and moist interior. For contrast, the slaw here has strong lemongrass and chili flavors, hot and sour notes. The Vietnamese style sauce that literally underlies the shrimp also has spicy and tangy elements, but it's more dominated by its touch of sweetness and garlic, with perhaps just a hint of fish sauce. This is a fusion dish that works extremely well. To be honest, I have few memories of the broccoli rabe which was underneath the thyme risotto custard. And no memory of the risotto custard at all. But I hope I never forget those scallops as long as I live. That night, I got lucky - I hit the jackpot. Never in my life have I tasted scallops so perfectly prepared. How the chef was able to put a crunchy top and bottom on each scallop while leaving the center of each one perfectly rare and moist is beyond me. 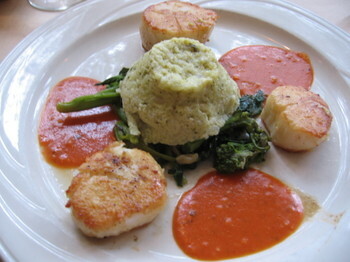 Frankly, I doubt if any chef could prepare scallops that perfect on a consistent basis. Each scallop tasted outstandingly fresh and was incredibly tender. I'm sure that the tomato truffle butter went well with the scallops, but again my only memory of that meal are those scallops because they were that good. The picture here does not do justice to the dish. The tilapia was tender and mildly flavored. The mashed potatoes were soft and rich. 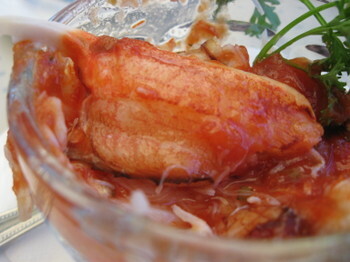 The vinegar butter was an ideal accompaniment to bring together the potatoes and the fish. This sweet and slightly sour gravy perfectly accented the flavor of the tilapia and simultaneously cut through some of the richness of the potatoes. To balance the soft textures and complementary flavors of the fish and potatoes, the perfectly cooked (meaning still very crunchy) and extremely fresh sugar snap peas added a major contrast in flavor, texture, and color. Nothing I have eaten in my life really prepared me for the look and the taste of this entrée. The salmon was, of course, perfectly grilled - with a slight touch of char and a wonderful moist and flaky interior. The fish itself was extremely fresh and well flavored. I have learned to expect this at Passionfish. What amazed me that evening and still amazes me is the accompaniment to the fish. While the plate and the fish were both hot, the chunks of cucumber were cool as well as crunchy. The contrasts in taste, temperature, and texture were outstanding. The medjool dates provided a hint of sweetness and the dill added a background spice note, but both were secondary flavors. I assume the beautiful green color resulted from puréed cucumber skin (because I could detect no other flavors), and the resulting two-tone color scheme of the entrée made it almost as attractive to my eyes as it was attractive in my mouth. The aioli was truly a case of gilding the lily as its flavors of coriander and roasted garlic were certainly not needed to make the dish a tasty success. The salmon was rich and flavorful enough on its own, but I was not tempted to scrape the rich aioli off the fish. This was certainly one of the best and most original salmon dishes I can remember. Kirk and Cathy are no doubt doing interesting things and eating wonderful food, but just don't feel like posting about it. So this is ed from Yuma filling in the gap with pictures and words about the salads and appetizers at Passionfish on the Monterey Peninsula. 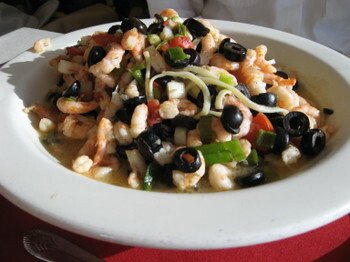 Many people feel that the best items on the Passionfish menu are their salads and appetizers. These days, the menu contains three separate pre-entrée categories: Teasers, First Courses, and Salads, but for purposes of this post, our focus will be on first, salads and then, other appetizers. Your eyes are not lying. Once the salad was made with roasted red beets, and once with yellow. In both cases the sweet earthiness of the roasted beet played off against the tang of the goat cheese. 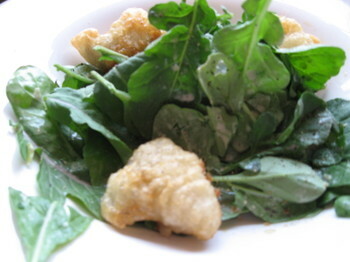 The deep-fried oniony flavor of the battered rings complemented the nutty arugula flavors. The varied textures also played across the tongue: the crunch of onion, the fleshy mouth feel of the beet, the chew of the greens, and the creaminess of the cheese. This amazing salad combined tastes that I never would have imagined putting together. Of course, if you're going to use a curried dressing on a salad (a thought that never occurred to me, I must admit) , it does make some sense to pair that salad with the complex sweet and fruit notes of a mango and currant chutney. But candied pecans? 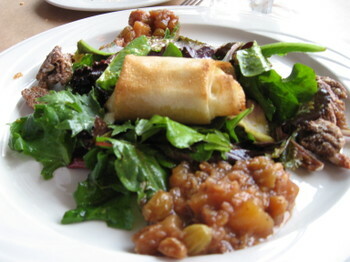 Yet the nuts added a different type of sweetness and certainly a distinctive crunchy texture to the salad. Most amazing in this context is the hot packet of crispy dough lying atop the salad. When cut open, the packet yields creamy melted Gorgonzola, the molten cheese adding salty and funky flavors that offer a total taste and textural contrast to the rest of the salad. 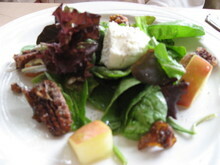 Again, the chef has sought to balance cheese flavors and textures with nuts, fruit, and greens. Steve and Helen wolfed down this salad so fast that I am unable to comment further as to how it tasted. The pristine Salinas Valley mixed greens were topped with four slices of succulent smoked sturgeon (as you can see, I ate half of one of the pieces before I remembered to take this picture). The firm flesh of the sturgeon had a distinct smoky flavor but was equally fresh and moist. It would not have been out of place on nigiri sushi rice. As the chef often likes to balance flavors, the savory fish was matched with sweet and sugary mashed medjool dates - as seen at the top and bottom of the plate. On each side of the plate were slices of crunchy celery in a celery puree. Once again, when I looked at the dish described on the menu, I had trouble imagining why these ingredients were together. Once I started putting them into my mouth, the chef's skill came through clearly. 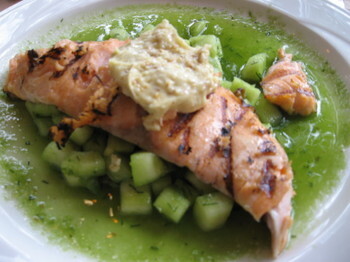 Celery and dates go together well, and both of them seem to bring out smoky and slightly fishy taste of the sturgeon. And all the other textures in the salad stood out from the firm cool fish flesh. For me, this little appetizer was much like two appetizers in one. When I took the first bite of one of the long flatworm-like objects tangled together around the middle of the plate, I was happy with the flavor but also puzzled, because I had forgotten some of the details of Melanie's discussion of this dish. My mouth was crunching on something with a very familiar flavor, but the input from my eyes and the input from my mouth didn't agree. I couldn't figure out what I was eating. Luckily our very friendly and competent waitperson was in the area and I asked her what those things where. When she told me that they were shaved fennel slices with seaweed, suddenly my culinary confusion was gone. When I put the next long slice in my mouth, I first could taste the light licorice flavor of the fennel, which I had not noticed on the first bite. Then I recognized the dominant flavor, which was the seaweed, even though visually the seaweed is a small element in the appetizer. Overall, the center of this appetizer tasted like a lightly fennel flavored and very crunchy seaweed salad. Really amazing. Around the edge of the seaweed/fennel combo were four plump briny oysters swimming in a sea of cucumber purée. 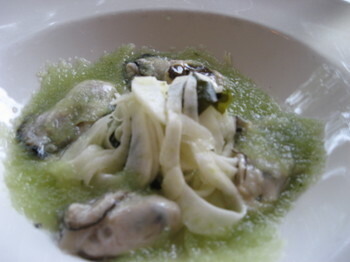 The oysters were clearly the star of this part of the dish and the cucumber relish showed off their flavor very well. Nonetheless, unlike Melanie, I felt that the two halves of this appetizer never truly went together. When I tried to eat fennel slices and oyster simultaneously, I loved the textual contrasts but found that to my mouth the tastes jarred against each other. Your results might differ. They say that a picture is worth a thousand words. In this case I will spare you those thousand words because that picture makes the best conclusion possible for a look at the salads and appetizers at Passionfish. Yum. Who knows what Kirk and Cathy are up to right now, but this is ed from Yuma - just back from two weeks in Monterey - and I want to share my experiences at one of my very favorite restaurants. This post is part one. If Kirk lets me go on, I will discuss salads and appetizers in part 2 and entrees in part 3. Kirk's recent post about his rotation made me realize that one restaurant, Passionfish on the Monterey Peninsula, 600 miles away from where I live, is definitely on my rotation. Some background: before I became ed from Yuma, I was once ed from Monterey, where I lived for a dozen years. These days, Monterey is my favorite vacation spot, and I still have friends in the area, including a very nice couple - obviously tolerant of eccentricity - who let me stay in the spare bedroom at their condo. For the last several years, I have enjoyed a couple of weeks escaping the searing summer weather in Yuma and savoring the beautiful scenery, the cool ocean breezes, and the wonderful restaurants in the Monterey area. While I do some cooking in their kitchen and sometimes Steve and Helen prepare meals as well, Monterey and its adjacent communities (Carmel, Pacific Grove, Seaside, Marina, among others) have numerous tempting restaurants that cater both to locals and to the innumerable tourists who flock like seagulls every summer to this beautiful part of the central California coast. Never much good at resisting temptation (which partly explains my lack of marital success), I willingly succumb to these alluring eateries and usually have 7 - 10 restaurant dinners at various spots during my stay. While I like to try new places as often as I can, every year I must have at least two dinners at Passionfish, at the corner of Congress and Lighthouse in Pacific Grove. Let me try to explain why. At first glance, this picture of a glass and a bottle of wine look pretty ordinary. Of course, the stemware is fine quality crystal (fairly common in good restaurants in the area), but it is the label on the bottle that is of most interest. 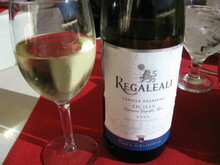 The grape variety, Arneis, is a relatively rare grape in the Piedmont region of northern Italy where it is originally from. Even rarer, this version comes from a California vineyard, and to be honest, I had no idea that anyone had planted this grape anywhere in California. By my standards, this is an unusual wine ($30), but such unusual wines are common on the broad and well-chosen wine list at the restaurant. As someone who grew tired of Chardonnay many years ago and someone who loves infinite variety (which also partly explains my lack of marital success), the list at Passionfish, with its pages and pages of excellent and unusual white and red wine choices, is, for me, as much fun to read as the latest issue of "Funny Times." What makes the wine list even more special is that Passionfish sells these wines at retail prices, the same price that one would pay for the identical bottle in a wine shop, if one frequented a wine shop good enough to have such an unusual wine. For example, this bottle of Marilyn Remark 2004 Marsanne (another rare grape varietal, especially in California) is on the wine list priced at $30. I saw an identical bottle at a local specialty grocery priced at $31. 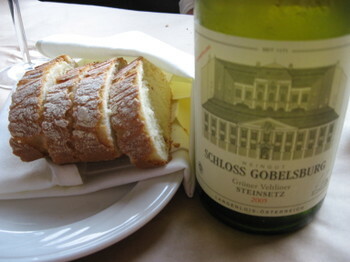 Another great tasting and unusual white wine is this estate bottled Gruener Veltliner from Schloss Gobelsburg in Austria, another $30 value. The only real problem with the wine list is selecting which one or two bottles to drink. The last two pictures also illustrate another strength of the restaurant. Soon after being seated, diners are served several warmed pieces of the very best bread that I have eaten in years - if not ever. Accompanied by whipped unsalted butter, each slice is a sheer delight. The warm bread is so fresh that it has that just baked taste and smell. Although not a sourdough, the bread has a thick and supremely crunchy crust that crackles when bitten and contrasts with the soft bready interior, which has a slightly moist, dense fine crumb. The bread's quality can be seen in the evenness of the tiny air pockets in the bread, no empty bubbles of air in any piece. In my opinion, the San Francisco Bay area and the Monterey Bay area produce the best bread in the entire United States. Nonetheless, the bread at Passionfish stands head and shoulders above any other that I remember. My waking thought the morning after my first meal at Passionfish this year was not about the incredible entrée or the outstanding salad or even the unusual bottle of wine I had consumed the night before. No, I woke up reliving the taste and textures of this wonderful bread. My friend Steve has long loved seared ahi and has often ordered this dish at Passionfish. Every time I have had a taste of his nearly raw tuna, I have been impressed by the freshness and quality of the fish. 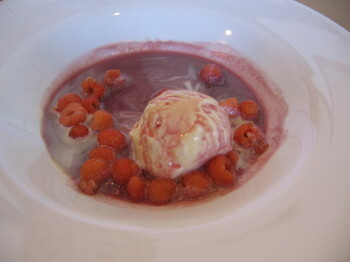 In addition, this dish illustrates how the chef utilizes culinary fusion - often very effectively. In this dish, for example, we have a Japanese influence in the nearly raw tuna, the use of wasabi, and the topping of seaweed salad. But the word "slaw" with its Dutch roots reminds us that various cold salads are part of the American and western European traditions as is the use of tart green apple. Similarly, the menu bristles with terms like ravioli, spaetzle, charmoula, goat cheese, lemongrass, tostadita, medjool, risotto, Kurobuta etc. The kitchen clearly enjoys playing with various flavors and culinary traditions and recognizes no boundaries or borders. Of course, such cooking is risky, but it is also intriguing and challenging. What is equally impressive about this dish (like many others on the menu) is that it has evolved over the years. If memory serves, the first two or three times that Steve ordered the dish, the tuna was crusted with black pepper and the slaw was julienned jicama lightly coated with a wasabi flavored coleslaw dressing and topped with pea shoots. 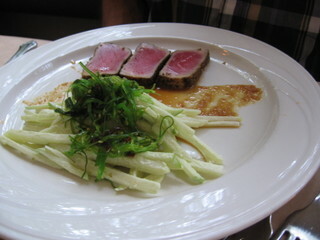 In last year's version (as seen in the photo), the ahi was crusted with a fennel seed rub, and the jicama and pea shoots were replaced by julienned green apple topped with seaweed salad. This year, the appetizer was absent from the menu altogether. In other words, the chef is constantly experimenting. He refuses to rest on his laurels, and his menu is constantly morphing. The menu not only changes over the years, but many items change week to week, and most days additional specials are available. One of my local friends suggests that the chef must go home every night thinking about ways to change and improve the food. This wonderful salad combines the nutty flavor of arugula, the tang of the dressing, and the succulent flavors of cooked oysters, while it contrasts the textures of the greens with the crunchy exterior and the soft, moist, and tender interior of the oysters. As I was taking this photo, a woman seated at the next table asked why I was taking pictures, and I gave my usual answer that I put the pics on my computer, which allows me to savor the meal again and again. She then asked if I was a Chowhound and mentioned that she went to the site often. I confessed I was, and after chatting with her for a minute or two, I went back to enjoying the salad. While this dish may look like a busy mess, the balancing of flavors is incredible. Nueske bacon is heavily smoked with applewood, so the equivalent of one or two slices gives the whole plate a smoky flavor which balances perfectly with the sweetness of the corn which itself is balanced with the tang of the tomato vinaigrette, all the flavors centered by the firm waxiness of the banana potato slices and the mildly fishy flavor of the sturgeon. As I was savoring this wonderful concoction, the same woman from the next table leaned over and told me that there was another Chowhound at the next table over who was taking pictures of her food as well. When I went over and introduced myself, it turned out to be tokyoastrogirl (her blog is called Tuna Toast) who had ordered exactly the same meal as I did. Small world - but more evidence of the sort of restaurant Passionfish is. While this culinary creativity sometimes works so well that it can leave a diner almost breathless with admiration; sometimes it can lead to mistakes (read the various comments, particularly Melanie's, at this Chowhound post for evidence). 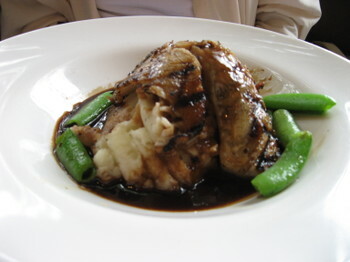 Similarly, since the menu is constantly changing, a customer looking for an old favorite may well come away frustrated. I still remember a halibut dish that came with broth containing vegetables and little gnocchi. It was tasty and unusual, and I would like to try it again, but I have never seen it repeated on the menu. The restaurant has two other failings in my mind. Sometimes, particularly on weekend evenings, Passionfish gets uncomfortably loud. There seems to be little effort at noise abatement as most of the walls and ceilings are hard surfaces. In addition, eating an excellent meal and drinking bottles of very reasonably priced wine certainly fuels conversation. And once the noise level reaches a certain threshold, everyone has to TALK VERY LOUDLY in order to be heard across the table. At this point, all the conversations in the restaurant have to rise to a higher sonic level, and the din becomes deafening. The second major shortcoming of the restaurant is its view. Many people come to the Monterey Peninsula for the incredible natural beauty of the area, but outside of the beautiful food (and perhaps your attractive companion(s) at the table), a diner's views at Passionfish are restricted to an office plaza or a Shell station. So I suggest one go walk in the afternoon at Point Lobos for the scenery - and eat that night at Passionfish for the food. 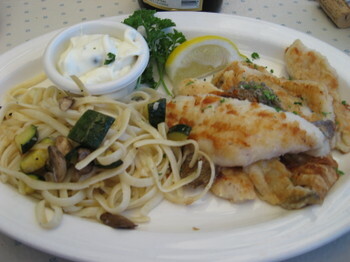 Passionfish, 701 Lighthouse Ave, Pacific Grove CA 93950, (831) 655-3311.